Hello, Hope your day is off to a good start. 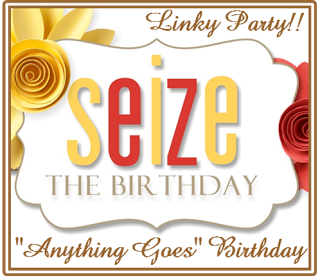 It’s time again for our Anything Goes over at Seize the Birthday. I would love for you to join us, but please remember to make it a Birthday theme. Here are a few card details: I got this wooden stamp recently and couldn’t wait to ink it up! First, I inked it up with very light grey ink and then colored it in with Prisma Colored Pencils. I believe it’s only the second or third time that I have colored on black cardstock. I love the look of it, and not sure why I don’t do it more. The banner die is from MFT and the sentiment is from Verve. In hindsight, I wish I hadn’t added the various (MFT) leaves in the open spaces…but what you gonna’ do. What’s done is done. 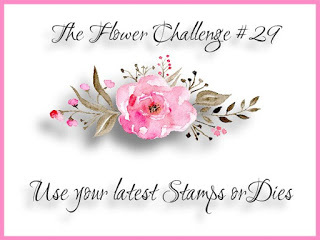 I would love to also link this card up over at The Flower Challenge where they want us to use one of our latest stamps. 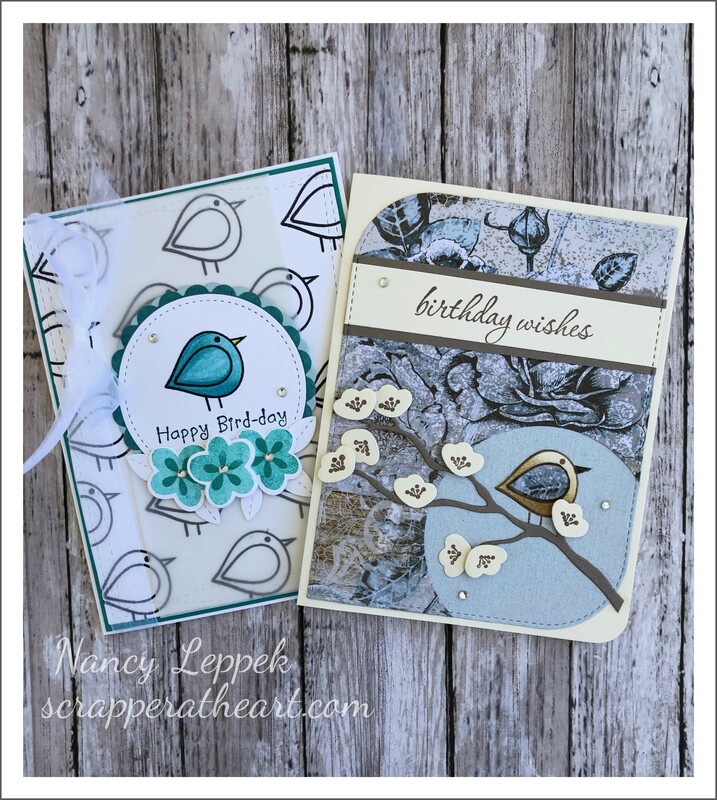 The DT and our Surprise Party Guest Julie have really got some great cards over on the blog, come on over and check them out. 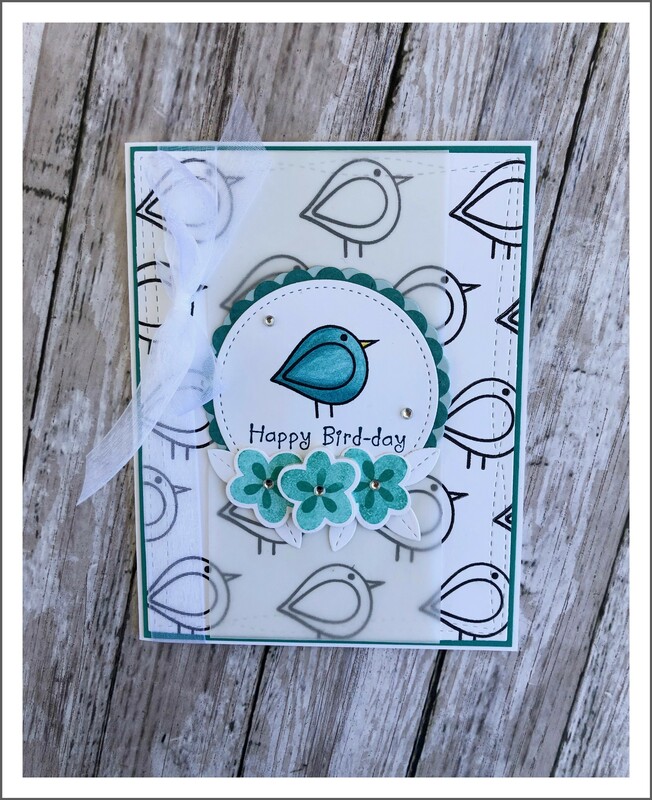 Categories: Cards | Tags: Card making, Cards, colored pencils, Happy Birthday, my favorite things, rubber stamps, stamping, Verve Stamps | Permalink. 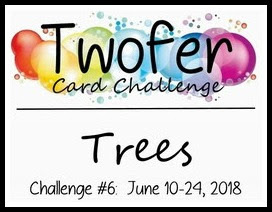 It’s coming down to the wire, but I finally have two cards ready for the Twofer Challenge. The theme this month is Birds. However, that is one stamp I don’t have a “flock” of. Yes, I went there! LOL Over the long weekend as I was pondering this dilemma, I remembered I had a Verve set with a bird in it that I could use. Score! Love when things fall into place. Here are a few details…For the white card; I used some MFT floral stamps and dies, sentiment is from Darcies, and a piece of vellum to soften the center of the card. I doubled my scallop die underneath my SU stitched circle, Finally, I added a side bow, as I felt like it needed something more. For the floral card; I used a beautiful piece of DSP (that I have been saving from Kaiser), I lightly inked and paper pieced my little bird, flowers/dies are also MFT, the branch is from SU, and the sentiment is from Hero Arts. I cut a hole in the DSP, cause in the pic it appears the blue piece is on top. 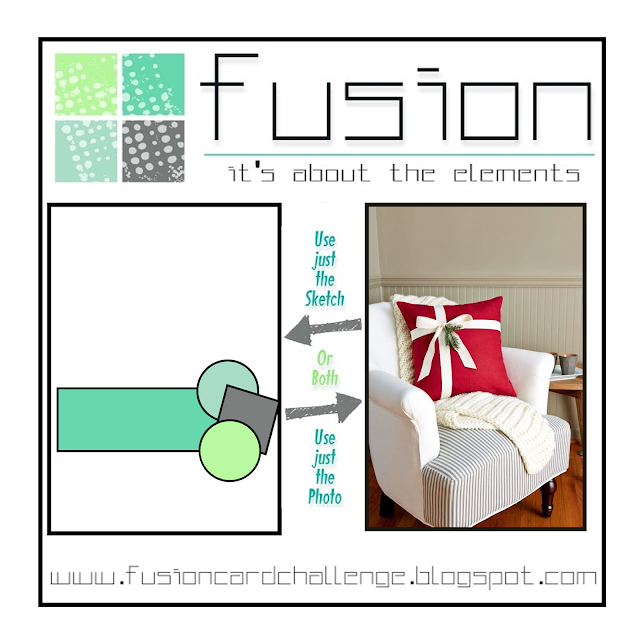 That fun stitched rounded corners die is from MFT. Categories: Cards | Tags: Cards, colored pencils, Happy Birthday, rubber stamps, stamping, Verve Stamps | Permalink. Hello, Hope you are having a great day so far! Life has hit a big bump at the moment and I am hanging on by a thread! My dad (88) fractured his pelvis and I am running on fumes. So bare with me the next few weeks or months till things settle down. 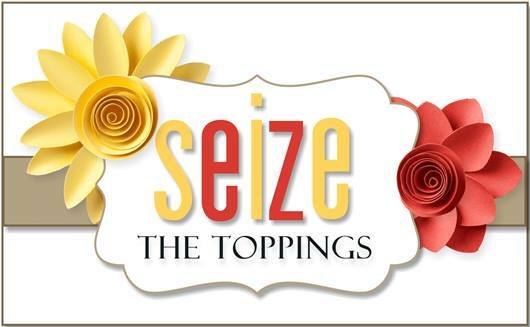 Today is the start of our next challenge over at Seize the Birthday. The topping we have for you today is Water. 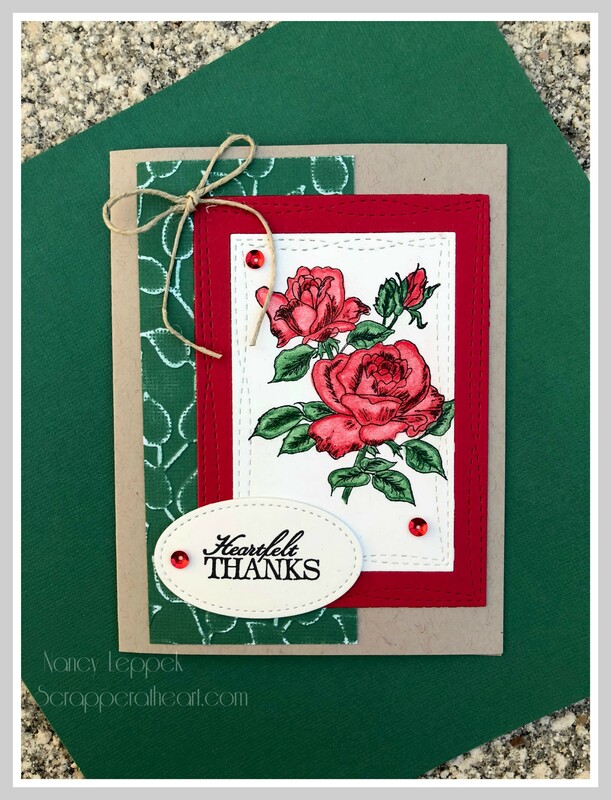 Luckily for me this card has been done for quite sometime or I wouldn’t have had anything to share with you today! I can’t even begin to tell you where this image is from…it’s a digital I printed about 5+ years ago. I used my colored pencils, some MFT and Lawn Fawn dies to complete my card. The sentiment is Verve of course! 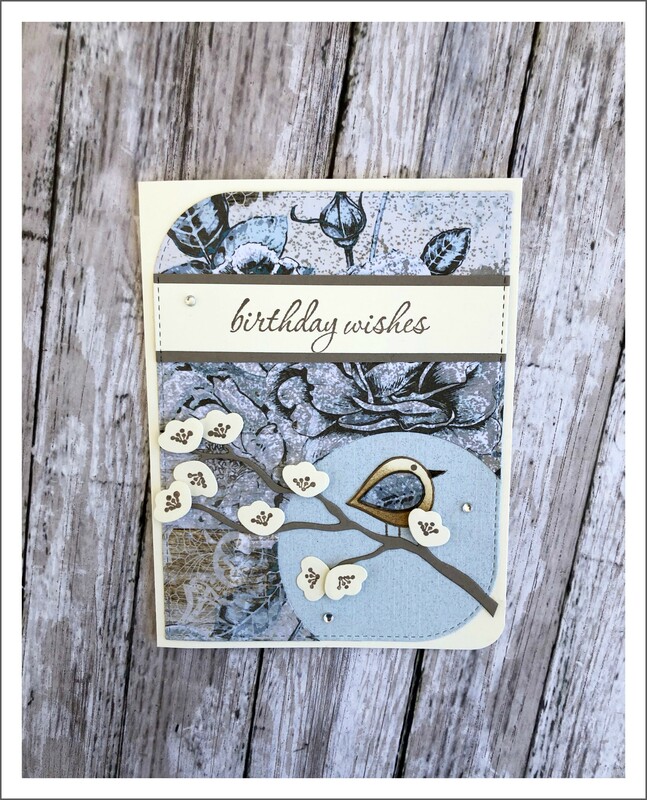 Categories: Cards | Tags: Card making, Cards, colored pencils, Happy Birthday, lawn fawn, MFT, rubber stamps, stamping | Permalink. 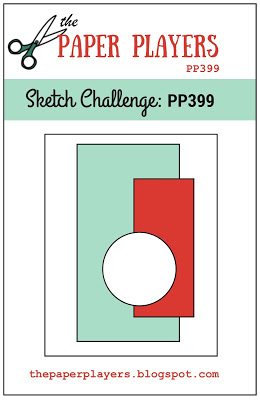 Got a quick post for you today for the great Sketch over at The Paper Players Challenge along with day 25 of the 30 day Coloring Challenge. I have missed three out of the 25 days, but I am pretty happy with those results. Hopefully, I can finish strong. I colored the above image with Prisma Colored pencils. This is one of my go to images and color combos with this particular stamp. It’s one of my favs! Love the look of sandpaper on white core paper. If you haven’t tried it you must! 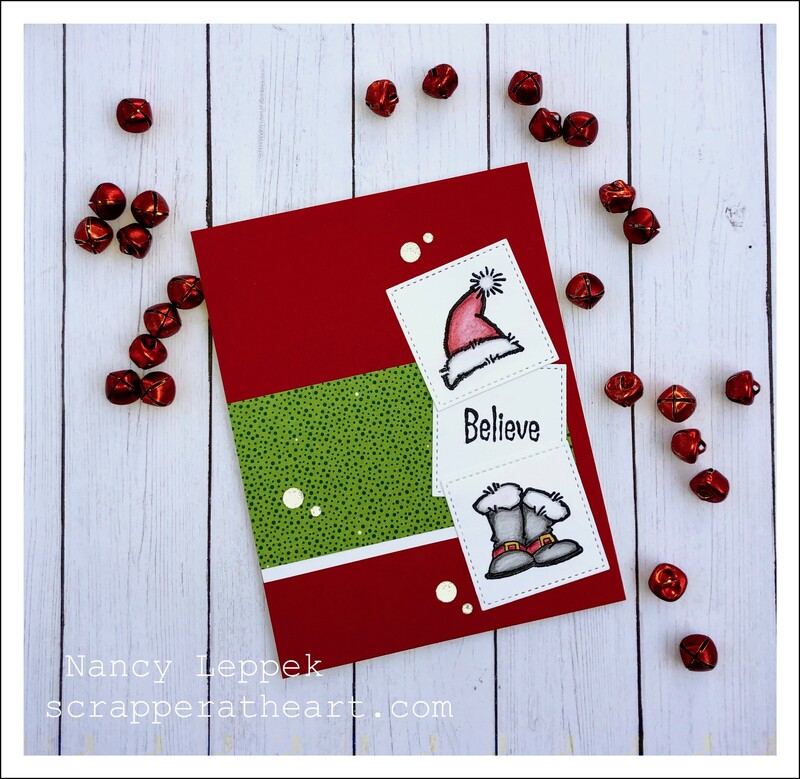 Categories: Cards | Tags: Card making, Cards, colored pencils, rubber stamps, sketch challenge, Thank you card, Verve Stamps | Permalink. I had sometime today to do some coloring and decided I better get on the stick when it comes to Christmas cards. I am way behind what I did last year. I made 4 cards every month and I was nearly done by November. However, I am not going to dwell on that. I’m going to celebrate that this is number 4! I knew the CAS Christmas Card Challenge was nearly coming to and end and the word is Masculine and I thought this cute little Palm Tree might do the trick. Categories: Uncategorized | Tags: Card making, Cards, Christmas cards, colored pencils, rubber stamps, stamping | Permalink. I have wanted so badly to join in the fun over at the Twofer Challenge this month, and couldn’t seem to settle on the perfect stamp. 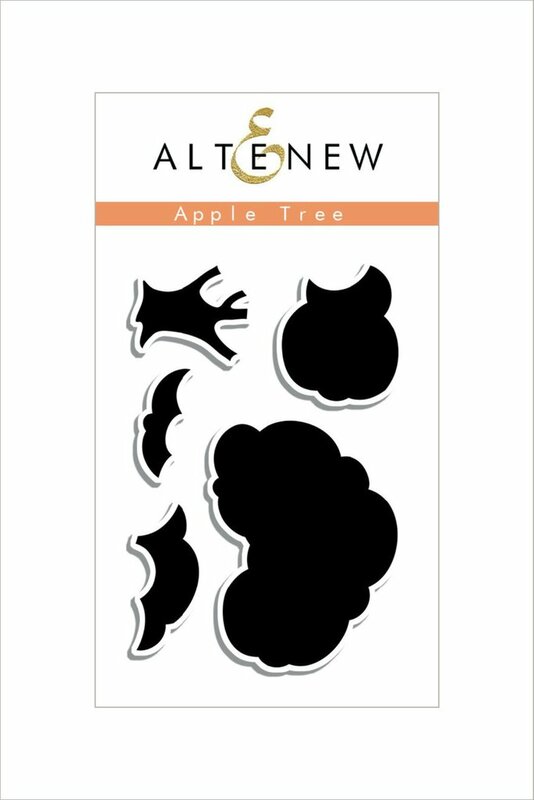 Then I came across a never used stamp set from Altenew, that I completely forgot I had. They so happen to be trees! Apple trees actually. It was fate, I tell you! 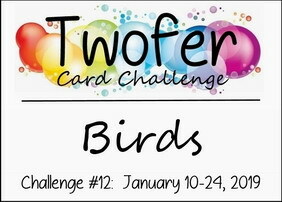 If you aren’t familiar with the Twofer Challenge you have to go check it out! You take their theme of the month and make two completely different cards using the same stamp/ die or what have you. Darnell and the team are fabulous! 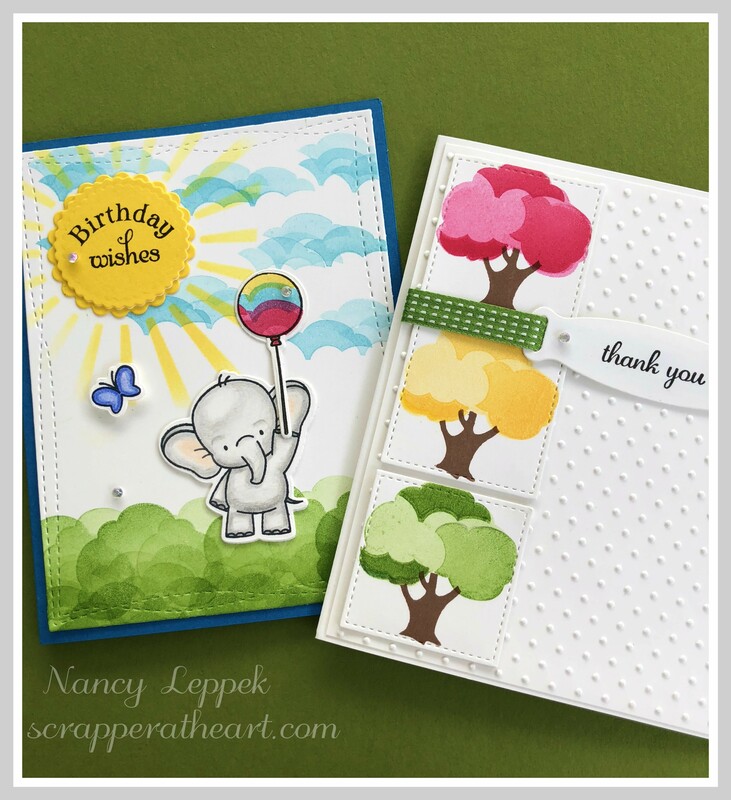 On the Elephant card I used the tops of the tree to make the clouds, the grass, bushes, and to color my balloon. Here is a picture of the stamp set so you may understand it better. On the tree card, it was a bit tricky to line the stamps up perfectly even after lots of practice. I think they look pretty good, but the yellow one is the best! Categories: Cards | Tags: Card making, Cards, colored pencils, Happy Birthday, my favorite things, rubber stamps, stamping, Stamping Up, Thank you card | Permalink. Hello, Hope you are having a good day! 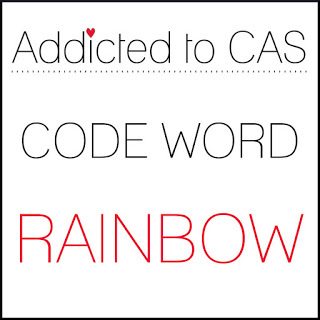 I have been eyeing this challenge over at Addicted to CAS and decided to take sometime today to join in. The challenge is rainbow. Hopefully the added embellishments doesn’t disqualify me from CAS. However if it does, I had fun just the same. 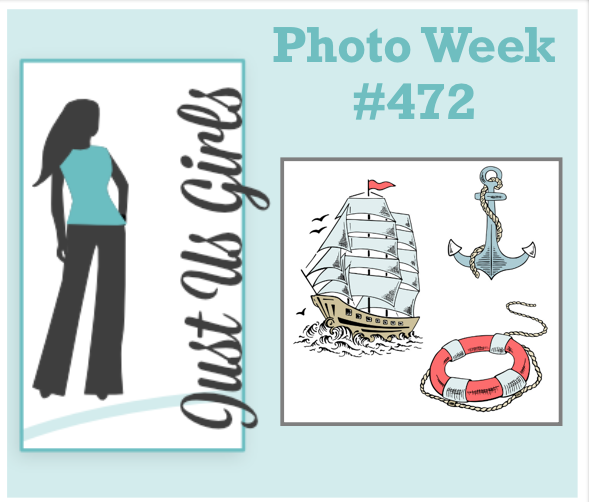 I am also linking up to the Addicted to Stamps and More site where it’s Anything Goes. 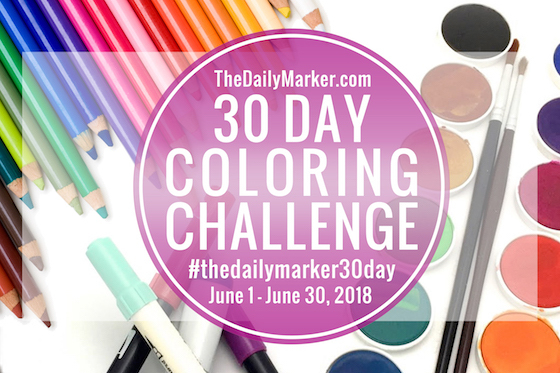 I am also enjoying the 30 day coloring challenge but unfortunately I missed yesterday and messed up my perfect track record. I know it’s not a huge deal in the grand scheme of life, but disappointed just the same. The negative heart die is from SU, the hill stitched border is Lawn Fawn and the stamps and letter dies are MFT. 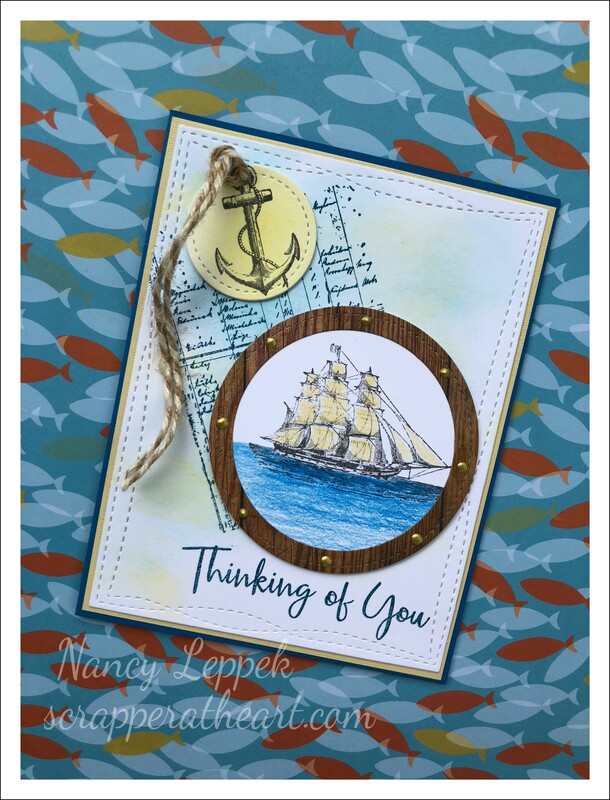 Categories: Cards | Tags: Card making, Cards, colored pencils, die cuts, miss you, my favorite things, rubber stamps, stamping | Permalink. 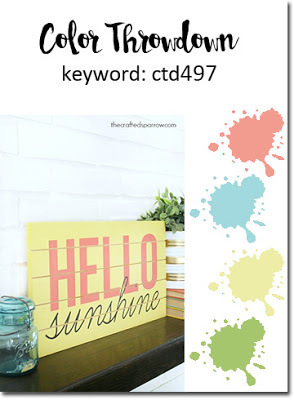 I have another card today for the Daily Marker 30 day Challenge and for this great color combo over at the Color Throwdown. I really enjoy playing with my Oxide Inks and today’s card is a mix of a little colored pencil with background blending. 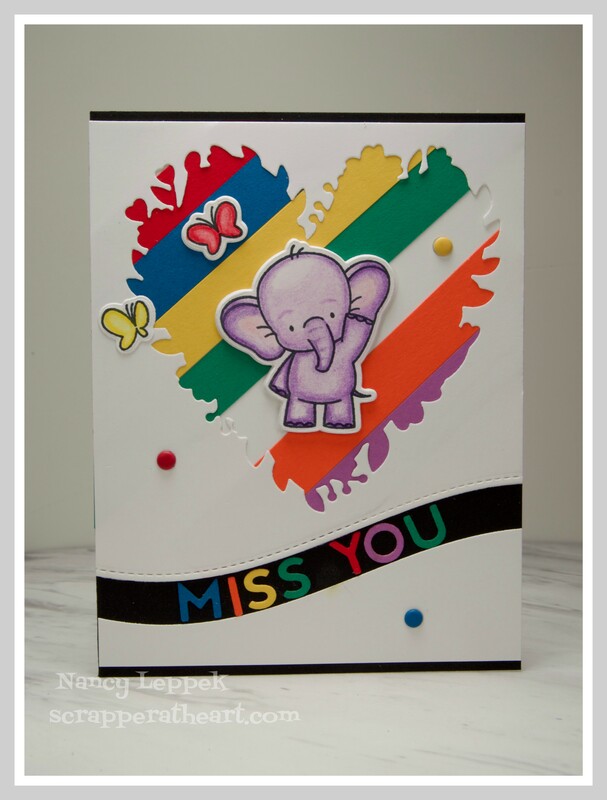 These MFT elephants just make me smile. This is the first time I am happy with the results of adding the water droplets to my background. Usually they are so clumpy and look so forced. 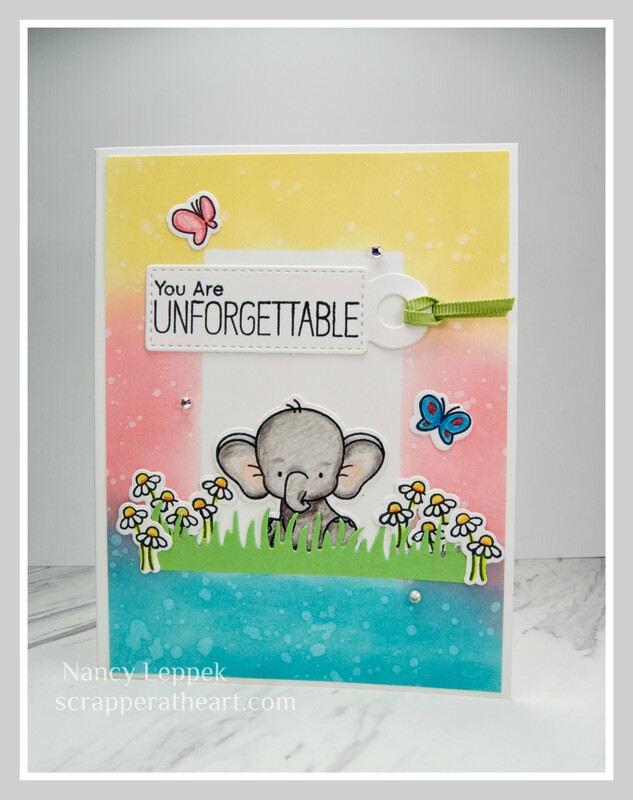 Categories: Cards | Tags: Adorable Elephants, Card making, Cards, colored pencils, MFT, oxide inks, Thinking of you | Permalink.